Google is doing all it can to force brands over the mobile cliff. It’s not working apparently. Nor is the obvious fact (glaringly obvious at this point) that the entire realm of online consumer media consumption is moving to mobile. The charts included in this post are from a recent Business Insider article that speaks to how Top US brands still are not mobile-ready. In my experience from being on the other side of this syndrome, the issue resides at the top of the food chain at the C level. Most, if not all, rank and file brand people are fully aware of this glaring omission. Speaking to them and their exasperation is profound: “I know. We are aware of this and we are on top of it. Stay tuned” or “I know, I know. It’s a big missing right now, and from what I hear, Exec Mgmt. is working on a global mobile portfolio strategy” or some gobbled-y-gook like that. More likely, the bureaucrats are still trying to figure it out, or are hiding under their desks waiting for IT to make sense of it or for some agency partner to tell them what to do. The bottom line is that it’s not getting done. For those who view the absence of mobile-specific web content as an indicator of no mobile strategy, many large top brands, like Snuggle, for instance, still have no mobile strategy. Now in all fairness to Snuggle, they may be in the process of building mobile content while I write this post, but putting up a simple mobile-friendly landing page should take a week at most. And at this stage, it’s a week too late. You know that I have been beating the drum about this issue a lot on these pages, but it defies understanding when billion dollar brands can’t get out of their way fast enough to move in step with the times. This is the reason that smaller start-up brands are able to appear more innovative and gain more traction from mobile users. Fewer executive layers, less committee, less pontificating, leaner IT cycles. It’s not that smaller brands are any smarter, or better marketers even. They are not. P&G and their ilk are brilliant folks – they just have created monstrous battle ships that are hard (or impossible) to turn around. And making a billion dollars a year globally makes it easier to rest back on their laurels and “work on a cohesive strategy that takes into account all of our key stakeholders while maintaining our commitment to excellence for our loyal consumers” blah blah. 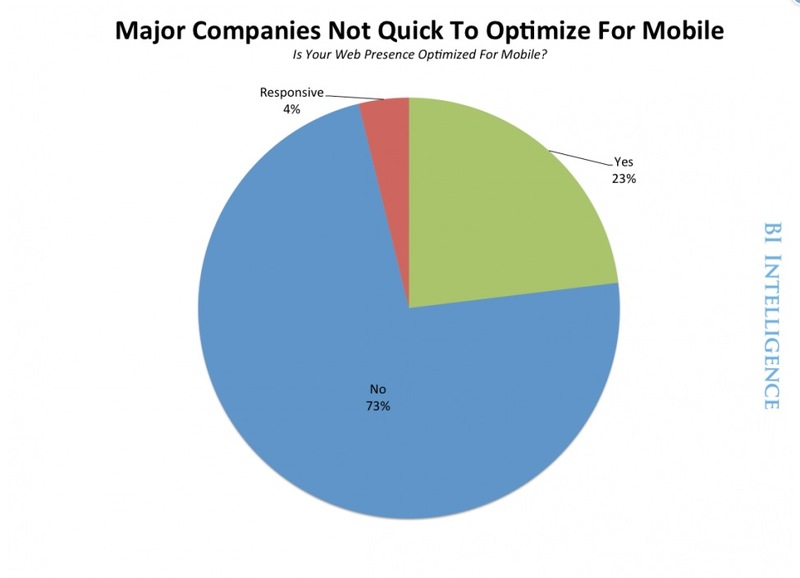 The Business Insider study conducted by Pure Oxygen Labs, indicates that 44% of Fortune 100 brands have no mobile content strategy – and only 56% are currently serving mobile-optimized content. 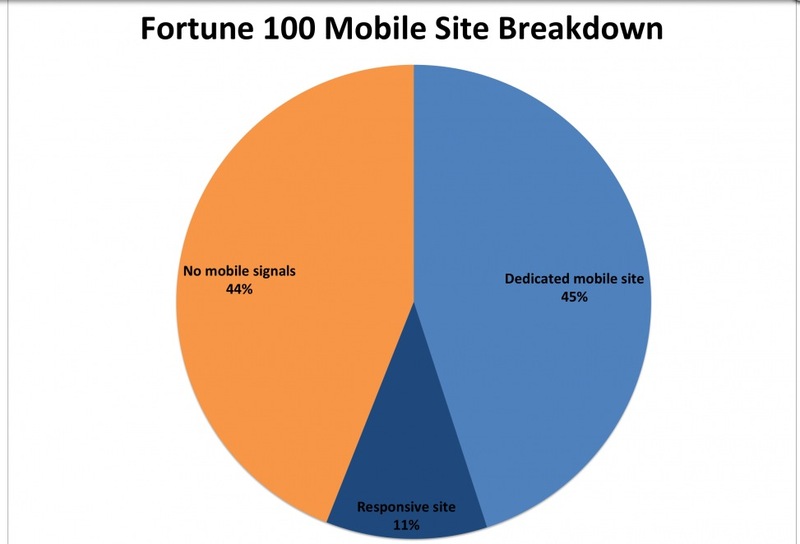 Only 45% have built dedicated mobile sites, while only 11% deployed responsive websites. Google’s new requirements support a Responsive Design strategy – and this makes sense – as the development of a true Responsive Strategy would require a great deal more thinking and organizational alignment than just creating a simple mobile-friendly approach. Responsive Design is not a development plan. It’s a Strategic approach that impacts all online and off-line digital content. Developing a Responsive strategy would in fact FORCE all executive marketing layers to align and orchestrate across the entire communications and IT spectrum. And that’s what all of todays brands need to do. Re-arrange the entire structure of their development, deployment, targeting, content management and analytical disciplines. And this is what will happen. Eventually. Just not today when it offers brands the most obvious opportunity for competitive advantage. CMOs should be drooling over this ripe time in history when 1 month head start will gain them a 6 month lead in the race.